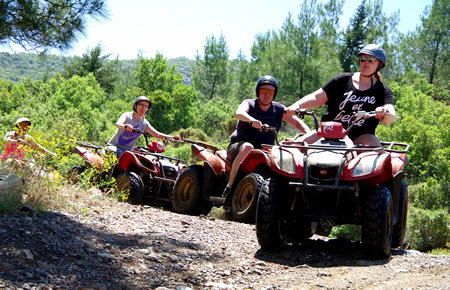 Experience the thrill of mastering a quad bike and join us on this exciting day bound to be the highlight of your Bodrum holiday. An unbeatable adventure for both young and mature adventure seekers. Our venue, 10 km to the east of Bodrum, in the forests nearby by Mumcular Lake, sets a unique stage for this extreme sport. 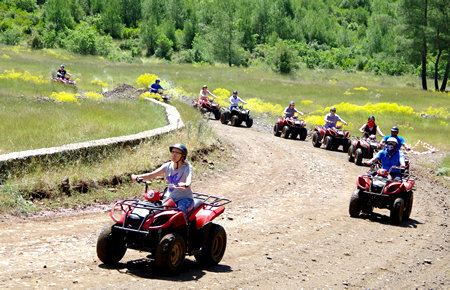 Following an introduction and safety briefing, the Quads line up for a convoy that is lead and tailed by expert guides and experience a half hour familiarization session on smooth trails of the flat terrain. Once you have mastered the controls and know the ropes, a more challenging ride awaits you: a harder terrain which will have you, riding on dust and dirt laden tracks to our private land of 40 acres where you can put your skills to the test on our purpose built jumps and slopes. 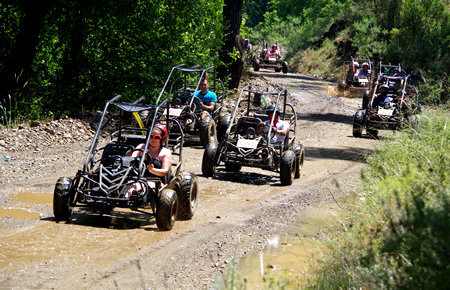 A half-day activity of pure adrenalin and fun!